For other uses, see Journalist (disambiguation). "Reporter" redirects here. For other uses, see Reporter (disambiguation). A journalist is a person who collects, writes, or distributes news or other current information to the public. A journalist's work is called journalism. A journalist can work with general issues or specialize in certain issues. However, most journalists tend to specialize, and by cooperating with other journalists, produce journals that span many topics. For example, a sports journalist covers news within the world of sports, but this journalist may be a part of a newspaper that covers many different topics. A reporter is a type of journalist who researches, writes, and reports on information in order to present in sources, conduct interviews, engage in research, and make reports. The information-gathering part of a journalist's job is sometimes called reporting, in contrast to the production part of the job such as writing articles. Reporters may split their time between working in a newsroom and going out to witness events or interviewing people. Reporters may be assigned a specific beat or area of coverage. Depending on the context, the term journalist may include various types of editors, editorial writers, columnists, and visual journalists, such as photojournalists (journalists who use the medium of photography). Journalism has developed a variety of ethics and standards. While objectivity and a lack of bias are of primary concern and importance, more liberal types of journalism, such as advocacy journalism and activism, intentionally adopt a non-objective viewpoint. This has become more prevalent with the advent of social media and blogs, as well as other platforms that are used to manipulate or sway social and political opinions and policies. These platforms often project extreme bias, as "sources" are not always held accountable or considered necessary in order to produce a written, televised, or otherwise "published" end product. Matthew C. Nisbet, who has written on science communication, has defined a "knowledge journalist" as a public intellectual who, like Walter Lippmann, David Brooks, Fareed Zakaria, Naomi Klein, Michael Pollan, Thomas Friedman, and Andrew Revkin, sees their role as researching complicated issues of fact or science which most laymen would not have the time or access to information to research themselves, then communicating an accurate and understandable version to the public as a teacher and policy advisor. In 2018, the United States Department of Labor's Occupational Outlook Handbook reported that employment for the category, "reporters, correspondents and broadcast news analysts," will decline 9 percent between 2016 and 2026. Journalists sometimes expose themselves to danger, particularly when reporting in areas of armed conflict or in states that do not respect the freedom of the press. Organizations such as the Committee to Protect Journalists and Reporters Without Borders publish reports on press freedom and advocate for journalistic freedom. As of November 2011, the Committee to Protect Journalists reports that 887 journalists have been killed worldwide since 1992 by murder (71%), crossfire or combat (17%), or on dangerous assignment (11%). The "ten deadliest countries" for journalists since 1992 have been Iraq (230 deaths), Philippines (109), Russia (77), Colombia (76), Mexico (69), Algeria (61), Pakistan (59), India (49), Somalia (45), Brazil (31) and Sri Lanka (30). The Committee to Protect Journalists also reports that as of December 1, 2010, 145 journalists were jailed worldwide for journalistic activities. Current numbers are even higher. The ten countries with the largest number of currently-imprisoned journalists are Turkey (95), China (34), Iran (34), Eritrea (17), Burma (13), Uzbekistan (6), Vietnam (5), Cuba (4), Ethiopia (4), and Sudan (3). Apart from the physical harm, journalists are harmed psychologically. This applies especially to war reporters, but their editorial offices at home often do not know how to deal appropriately with the reporters they expose to danger. Hence, a systematic and sustainable way of psychological support for traumatized journalists is strongly needed. However, only little and fragmented support programs exist so far. The Newseum in Washington, D.C. is home to the Journalists Memorial, which lists the names of over 2,100 journalists from around the world who were killed in the line of duty. It signals source supremacy in news making. It offends journalists’ professional culture, which emphasizes independence and editorial autonomy. This dance metaphor helps showcase consensus within the relationship but the article fully describe the common relation between the two "A relationship with sources that is too cozy is potentially compromising of journalists’ integrity and risks becoming collusive. Journalists have typically favored a more robust, conflict model, based on a crucial assumption that if the media are to function as watchdogs of powerful economic and political interests, journalists must establish their independence of sources or risk the fourth estate being driven by the fifth estate of public relations". According to Reporters Without Borders' annual report, the year 2018 was the worst year on record for deadly violence and abuse toward journalists; there was a 15 per cent increase in such killings since 2017. Ruben Pat was gunned down outside a Mexican beach bar. Yaser Murtaja was shot by an Israeli army sniper. Bulgarian Viktoria Marinova was beaten, raped and strangled. A car bomb killed Malta's Daphne Caruana Galizia. 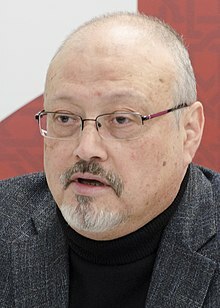 Jamal Khashoggi was killed inside Saudi Arabia's consulate in Istanbul on Oct 2. A program director sets the task for TV journalists, 1998.
a reporter for Radio Azadi interviews a citizen in Helmand Province, Afghanistan, 2009. Journalist interviews a cosplayer, 2012. Official tastes the water of a new well in front of journalists in Mogadishu, Somalia, 2014. ^ Diderot, Denis. "Journalist". The Encyclopedia of Diderot & d'Alembert: Collaborative Translations Project. Retrieved 1 April 2015. ^ Nisbet, Matthew C. (March – April 2009). "Communicating Climate Change: Why Frames Matter for Public Engagement". Environment Magazine. Heldref Publications. Taylor & Francis Group. Archived from the original on 3 July 2018. Retrieved 9 March 2019. ^ Nisbet, Matthew C. (March 2013). "Nature's Prophet: Bill McKibben as Journalist, Public Intellectual and Activist" (PDF). Discussion Paper Series #D-78. Joan Shorenstein Center on the Press, Politics and Public Policy, School of Communication and the Center for Social Media American University. p. 7. Retrieved 8 March 2013. ^ Talton, Jon (31 January 2018). "Occupational outlook: Where the big bucks are — and aren't". The Seattle Times. Retrieved 1 February 2018. ^ "1337 Journalists Killed". Committee to Protect Journalists. Retrieved 28 August 2012. ^ "Number of Jailed Journalists Nearly Doubles in Turkey". Los Angeles Times. 5 April 2012. Retrieved 6 April 2012. ^ "Iran, China drive prison tally to 14-year high". Committee to Protect Journalists. 8 December 2010. Retrieved 18 November 2011. ^ Tabeling, Petra (24 December 2014). "Petra Tabeling: In crisis areas, journalists are at risk in physical and psychological terms". D + C. p. 15. Retrieved 9 March 2019. ^ Lewis, Justin; Williams, Andrew; Franklin, Bob (6 February 2008). "A Compromised Fourth Estate". Journalism Studies. 9: 1–20. doi:10.1080/14616700701767974. ^ Langford, Eleanor (17 December 2018). "2018 was worst year for violence and abuse against journalists, report says". telegraph.co.uk. Telegraph Media Group Limited. Retrieved 7 January 2019. ^ "WORLDWIDE ROUND-UP of journalists killed, detained, held hostage, or missing in 2018" (PDF). Reporters Without Borders. 1 December 2018. Retrieved 7 January 2019. ^ Hjelmgaard, Kim (18 December 2018). "'Unscrupulous politicians' blamed for worst year on record for journalist killings". USA Today. Gannett. Retrieved 7 January 2019. Look up journalist in Wiktionary, the free dictionary.